I decided to write of my experience of having a MRI as there is very little information available for people who need to undergo an MRI head scan for whatever reason. Most of what I had been told was very negative even by 'experts' and the people at the Sydney Cochlear Implant Centre. My own personal experience is somewhat different to what I expected but certainly not as bad as what was perceived. 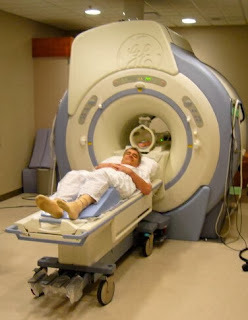 MRI stands for Magnetic Resonance Imaging. It is an scanning technique that uses a magnetic field and low-energy radio waves to take pictures of the soft tissues without the obstructions caused by bones. It is an important diagnostic tool for detecting abnormalities of the brain, spine and musculoskeletal systems. Metal implants, pins etc are a problem with MRI as the magnet used is inclined to attract metal objects and as such has a big impact on people who have any type of metal inserted into the body such as pins, artificial hips and of course cochlear implants. I have a Cochlear Implant and I needed an MRI. The type of implant you have will determine the strength of MRI you can be subjected to or whether you need to have the magnet surgically removed temporarily. 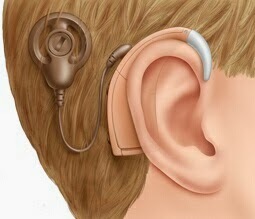 So long as Cochlear’s procedures are followed, an MRI will not damage the electronics of the implant. Cochlear produces a booklet called " MRI for Nucleus implant recipients: Radiographer's instructions" to assist you and the radiographer as to what type of cochlear needs surgical removal of the magnet & which just needs a bandage. At the back of the publication is the personal experience of a bilateral (2) implant recipient. Her experience mirrors mine in many areas. Still I have recorded my experience and have not white washed the pain at all. Do remember every person has a different pain threshold. I have been told any times through various experiences that I have a high pain threshold. That would not seem to be the case with this procedure. When I was asked to have a MRI, to ascertain the extent & details of my vascular nasal polyp (blocked sinus), my surgeon decided to tried to get enough information from a CT scan with a dye. This gave him insufficient information in preparation for surgical removal. He consulted with my cochlear surgeon and discovered what type of cochlear I had and what MRI I could possibly undergo. I was fortunate in that I did not need to have the magnet surgically removed which research indicates is a possibility. 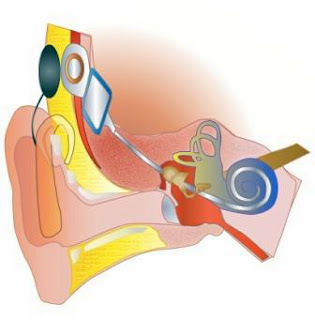 However the cochlear’s magnet implanted would still be attracted to the magnetic field and this will cause some considerable discomfort. My ENT surgeon procured the information package from the cochlear people on what to expect including specific information for the radiologists. I was also given crepe bandage and some padded dressings to apply at the radiologists. I had never had an MRI and I had no idea what to expect. When I arrived the nurse made sure that I knew what to expect when we went into the scanning room. He explained carefully that there would be some pain or at least discomfort involved. We discussed everything beforehand and he made sure I understood by having me repeat back nearly everything he told me, to make sure I heard and understood everything that was going to happen as once he starts to wrap the bandage around my head, he knew I would be totally reliant on lip reading as I would not be able to hear much without my cochlear and my hearing aid. All jewellery, belts and metal objects had to be removed. I was also asked if I had dentures that could come out. My head was very tightly bandaged with the padded dressings placed directly over the cochlear and encased within the crepe bandage. It was very tight but not painful. BTW - As I had been told it was a very painful procedure I decided to jump the gun and I took 2 Panadeine Forte (strong pain killers) just prior to the bandaging. 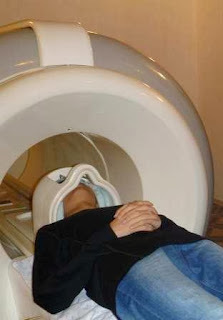 I was then asked to lie on the padded bench, with my head towards the machine. A cannula was inserted into my right arm on the inside of my elbow. First they injected a little saline and then later after maybe ¾ of the scans they injected some type of contrast dye and proceed to take some more pictures. I did not feel the saline or the dye but I hear that some people will notice a slight burning sensation or even a form of hot flush. I had a type of helmet put over my head. It comes down to about the tip of my nose but there are ‘holes’ so that you can see through the helmet. The nurse also inserted a piece of foam just forward of my ears to help ‘hold’ my head still. Then they rolled my bench into the machine. I had already been instructed that the whole procedure will take 15-20 minutes where I am to keep as still as possible. I am also told that there will be loud sounds and vibrations mostly the type accompanied by the sounds that deaf people in particularly are aware of. As I do have some hearing of the lower frequencies, I heard quite a lot of the sounds. It must be very loud to a hearing person as it seemed quite loud to me. If anything the constant noise bombardment was annoying – the noise, if I had to live with it, would drive me crazy! By the way, the noises changes frequently, some time it is a pulsing sound & vibration and others it is constant. It is also in different pitches. Yes it is painful. I would rate it as bad as 8 out of 10 with ten being unbearable. It is bad but not the type to make me cry - it was more like a very bad ache. 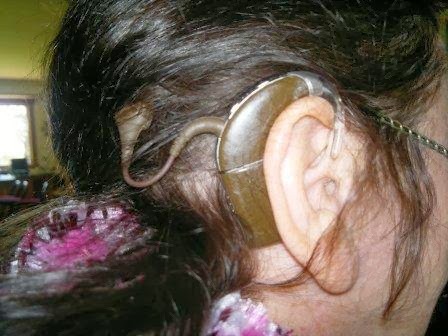 The first thing I noticed is that it felt like my head was laying on a rock that was really sticking into my head, at the location of my cochlear plate. I felt like I just wanted to lift my head off it and find a more comfortable position. The pain part is more like my head was in a helmet that was like a vice that was extremely tight and constantly squeezing ever tighter. The pain covered the area from the middle of the top of my head right across to the neck and shoulder of the same side as the cochlear. It is possible the neck and shoulder pain were the result of tension and lack of adequate neck support rather than directly attributed to the MRI. Part way through, I was temporarily removed for about 1 minute to have the dye injected into the cannula and then I was slid back into the machine for another 10 minutes. All up, the scans took 20 minutes. Once I was out of the machine I had a light headed moment where the room spun but soon all was back to normal. We removed the bandages from my head and I was sent on my way. The pain killers I think were a blessing as I didn’t really have a headache – I just had the ‘memory’ or rather it was like an imprint left in the sand – the pain was gone, but you still feel where it was just recently. After about 30 minutes I just had a tinge of a headache. I reckon the painkillers were doing a fine job. I did need to take some more painkillers after 4 hours. I also had a sleep after lunch but that might be more to do with the poor sleep I have been having due to not being able to breathe through my nose! I notice that tonight (10 hours after the scans), I probably could have a simple paracetamol as I have a touch of a head ache but I don’t like to take tablets generally, so I am putting up with it. I know I have gone into a great deal of detail but it is just so that you know what you could expect if you need to undergo a MRI if it is really necessary. It is painful but with some strong painkillers and the knowledge that it is all over and done with fairly quickly, less than half and hour, it is do-able. I certainly don’t want to do it again, but I could and I would do it again if the doctor deems it important. Three days later and it is more or less a distant memory, but one that has given me a constant headache since. I am still not keen to wear the cochlear. The area feels slightly bruised to the touch and I seem not to tolerate the sounds/sensations well at the moment. The doctor has the information he required and now I just have to wait for the cancer operation which thankfully is less than a week away. I was diagnosed with a head cancer (Adenoid Cystic Carcinoma) just 18 months ago and I did have a lot of problems with a MRI because having a cohlear is not MRI friendly as it tries to rip the magnet of the cochlear right out of my head - it was extremely painful even after advice from the cochlear centre to reduce the power and bandage up my head in a certain manner. My doc tried to avoid using an MRI but he just couldn't 'see' the affected area needed prior to my cancer operation with the other diagnosis imaging tools. The MRI dislodged the magnet of my cochlear and sadly it didn't go back into place so that effectively I have been unable to wear a cochlear in the 18months since. I get frequent headaches and the area around the implant is touch sensitive as though bruised. I have just started the process to have an operation to put the magnet back into place so that I can recommence wearing my cochlear. The good news is that I can replace my cochlear implant with an MRI friendly Cochlear implant that has only just been released in the last year or so.This is truly a blessing as the type of cancer I have will never go into remission and a yearly MRI is one of the diagnostic tools available to keep 'watch' on my cancer.